Earn $50 for Each Friend Who Becomes a New Radiance Client! A personal recommendation goes a long way and pays off. For every person you Refer to New Radiance Cosmetic Center we will reward you with a $50 Credit on your account at New Radiance! to be used toward any treatment, product or service when you friend spends just $199 or more at New Radiance. Not only does your friend receive $50 off their first visit, but we also give you a $50 credit on your account! Simply complete the form. It’s that easy! Your friend will receive an email telling them that you are responsible for giving them $50 Off any New Radiance service of $199 or more and a link to request a free consultation with your name referenced. If your friend accepts this offer and comes in and gets a qualifying service, you are qualified for a $50 New Radiance credit to your account which may be used on your very next visit. 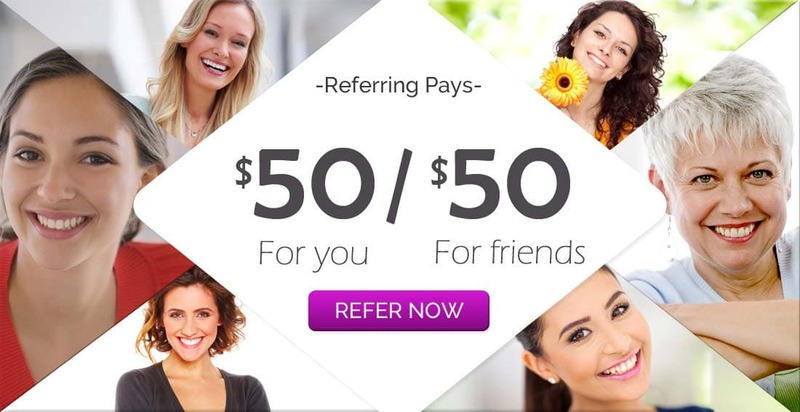 The more you refer, the more $50 credits you earn! Remember, our referral program is uncapped! You will continue to earn $50 for each valid referral you make. Thank you again for your referrals and for being a valued New Radiance client! ** A minimum purchase of $199 by the referral is required to qualify the Client for a New Radiance Reward o$50 fee. New Radiance personal needs to be aware of who you referred. Sometimes appointments will not be made at time of referral so please have your friend let us know you referred them to us or just let us know who you have referred.New Radiance Referral Reward do not expire and are non-transferable. May not be used toward previous purchases, redeemed for cash, or applied to cancellation fees or balances due. Must be used at originating New Radiance Cosmetic Center location only. No cash value. Program details are subject to change. Earn $50 When you Refer a Friend & Send Your Friend a $50 Gift Certificate! You should definitely know about New Radiance Cosmetic Center. I'm very happy with the treatments I've received and the staff is wonderful and consults are always Free. So here is a good deal, as a New Client, you get a $50 free gift certificate you can use on any service. Just thought I'd let you know!.